Those of you who follow Mark D. Sikes on his popular blog and Instagram feed know that he is all about classic style. Whether it’s his favorite blue and white stripes, red his way or timeless neutrals, his mantra is making it beautiful. 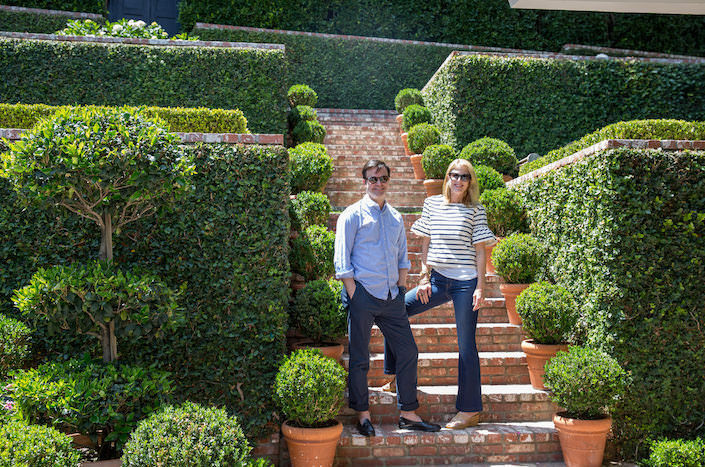 And in his own house in Los Angeles, he walks the walk with a focus on easy elegance and an indoor outdoor approach to living. Join Susanna Salk and me for a special video visit with Mark as he takes us behind the scenes at his beautiful California home. 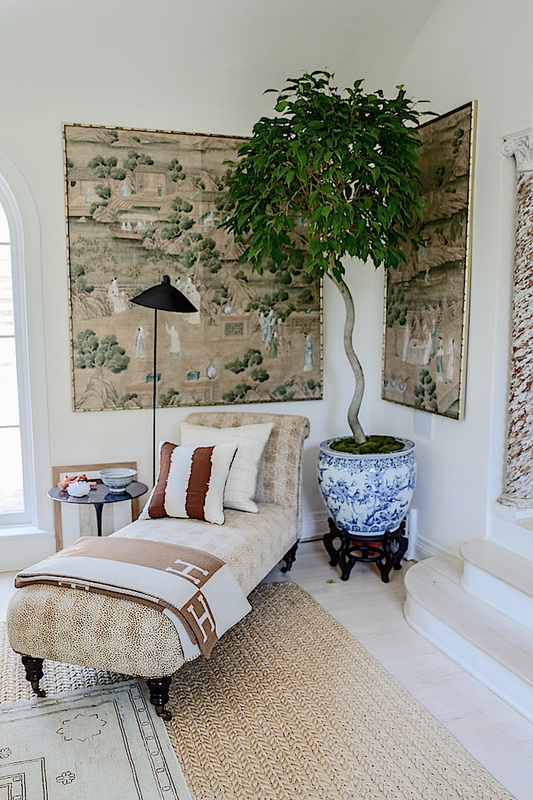 Antiques that Mark and partner Michael Griffin have collected over the years live comfortably with the designer’s signature mix of natural fibers, striped dhurries and chinoiserie. 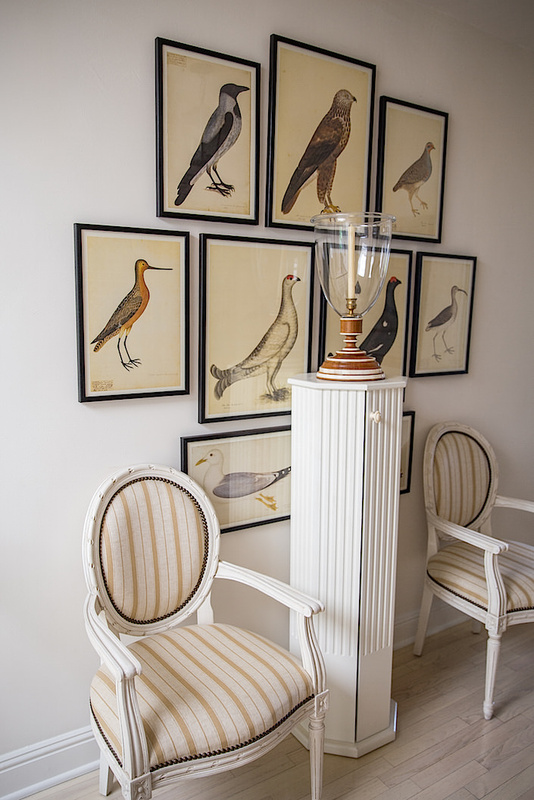 His former career in visual merchandising shows in his ability to create stylish livable rooms and layered vignettes. 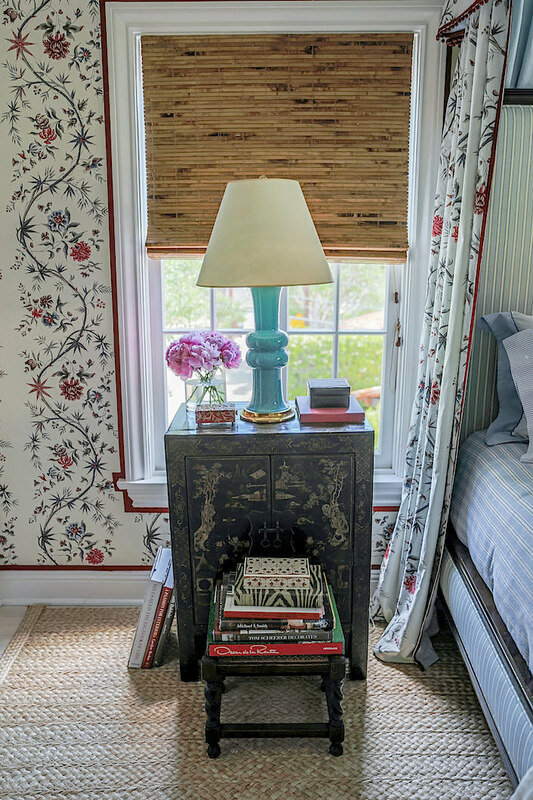 Mark’s enormous collection of books and magazines have helped him hone his eye and elucidate the style secrets of past masters. He often references iconic rooms and great designers who have inspired his updated version of classic style seen throughout the house. While each room may nod to the past, it is a reflection of Mark’s modern eye. Whether creating his fashion line or a new house, he knows how to translate the best for stylish living today. So thank you Mark for sharing your lovely home with us – you certainly know how to make it beautiful. 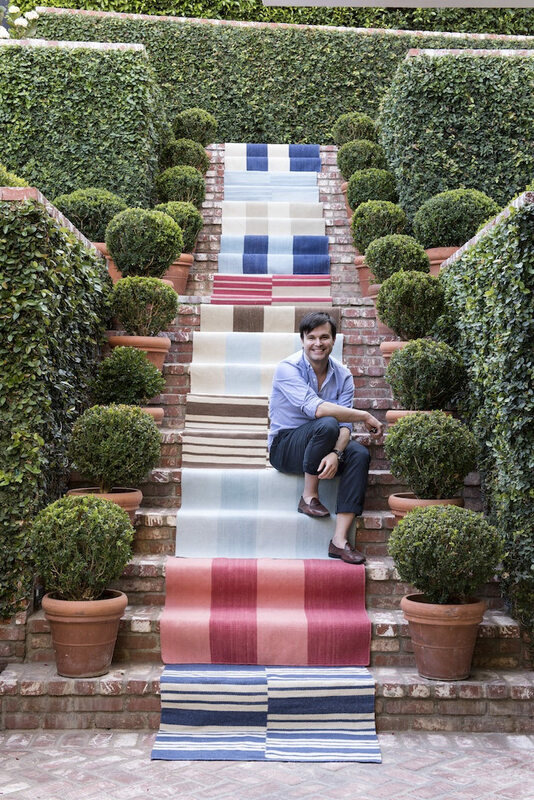 It’s this approachable California meets classic style that has led to such a successful year for Mark, including his bestselling book, Beautiful, fabric and furniture collections and his new California Stripes rug collection with Merida, who we are proud to have as our video sponsor. Known for their quality craftsmanship, commitment to integrity and ethical practices and innovative approach to traditional manufacturing and design, they were a natural partner for Mark, who already specked Merida rugs in almost every project. As Merida Creative Director, Roxanna Hanna explained, “I have always wanted to add handwoven dhurries to our portfolio. At Merida, we love being able to give a modern spin on traditional techniques and knew, in working with Mark, we could translate his all-American classic style into something fresh and current.” With four styles in a range of vibrant colorways, the collection is made to mix, match, or layer with a Merida natural fiber rug. And for designers, there is the option of full customization. With a heritage of quality makers and materials, Merida is dedicated to designing and manufacturing exceptional products that fuse modern sophistication with timeless tradition. This entry posted in At Home with, interior design, Quintessence video series, Stylish Shopping, travel. Entry Tags: At Home with, design video, interior design, Los Angeles, Mark D. Sikes, Merida, Video Bookmark the permalink. Such a fan of Mark D.Sikes, this was such a special treat for me to see how he lives in his beautiful surroundings. It makes me love his work and talents even more, Thank you!!! So beautiful – my cup of tea. Very eclectic. Fantastic! Beautiful! Regards from Chile! What a wonderful tour! I just love Mark’s place. Gorgeous! Beautifully decorated and edited home and beautifully filmed and edited video. Will watch this one over and over. Susanna Salk, you are the best! 84 queries in 0.873 seconds.